I enjoyed Threats of Sky and Sea, but there was something missing so I just could not love it. While I liked Breena’s (“Bree”) character, there were a few of the other characters I thought needed a little more work. I also thought that the writing and plot needed some tightening as well. Threats of Sky and Sea is written in first person point of view, which tended to draw me out of instead of immerse me into the story. Whenever I would see a verb tense that didn’t look right, I would have to reread the sentence again to make sure that it was actually making sense and that the verb tense was correct. If I’m noticing verb tense in a story, I am not paying attention to the actual story. There were also some grammatical issues, which I’m thinking may have been a deliberate choice of the author. I think this because one of Bree’s maids corrects her grammar, but then Bree continues to make the same grammatical error. It may not have annoyed me otherwise, but the author chose to deliberately point it out. My favorite part of Threats of Sky and Sea was Bree. She had a good head on her shoulders, and she was very strong-willed. She refused to let the king intimidate her too much and she was loyal to her father. However, she is in a pretty terrible position being at court without her father, especially considering her father told her basically nothing about their world. This is one of my least favorite plot devices where the main character is told nothing about the world and must find out each detail painstakingly slow and only after being told by someone else or making some mistake. This also caused the story to drag in some places, especially since Bree figured out things a lot slower that I thought she would. My biggest plot issue though had to do with Bree’s actions and the wind elemental power. Apparently people with the wind power can eavesdrop on other people, so there is a lot of discussing the fact that Bree and her friends cannot discuss plans/plots/etc. Except they discuss these plans and plots all over the palace, all of the time, except, of course, for the plans for the big showdown. I just kept wondering why they didn’t write things down - just pass notes like they were in grade school and have the fire elemental burn them immediately. Although I thought that Bree was a great heroine, I thought a lot of the other characters were too flat. The evil king was just evil and cruel, for apparently no reason except that he wanted to own the entire world. Also the foil prince was just too sugary good without enough backbone. 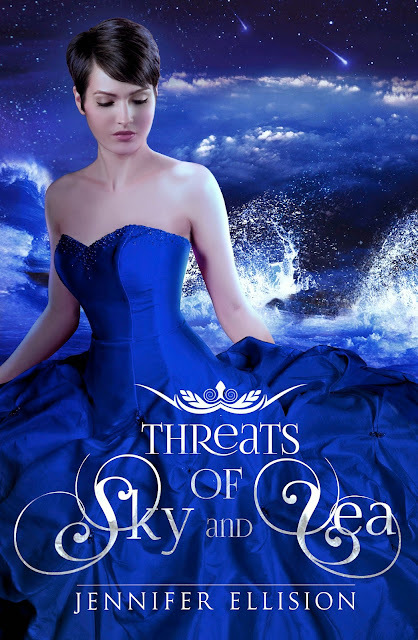 I enjoyed Threats of Sky and Sea because I liked Bree’s character, and I thought the elemental powers were interesting. However, I did have several issues with the plot and writing. Those issues aside, I’m interested enough in Bree’s story to see what happens in the next book, especially since this left so many ends open.